Temporary waters are found throughout the world, and include intermittent streams and ponds, episodic rain puddles, seasonal limestone lakes, the water-retaining structures of plants, such as bromeliads and pitcher plants, and a variety of man-made container habitats. They are probably populated by various plant, animal, and microscopic communities ranging from the very simple to the highly complex. 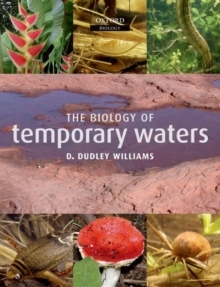 Temporary waters therefore represent fascinating and significantarenas in which to study the properties of species, as the latter deal with the rigours of living in highly variable environments. Obligate temporary water species display a remarkable array of adaptations to the periodic loss of their primary medium that largely set them apart from the inhabitants ofpermanent water bodies. Survival of individuals frequently depends upon exceptional physiological tolerance or effective migrational abilities that are timed to appropriate habitat phases. Quite apart from their inherent biological interest, temporary waters are now in the limelight from a conservation perspective as these habitats come more and more into conflict with human activities. Traditionally, many temporary waters (be they ponds, pools, streams, or wetlands) have been considered to be'wasted' areas of land, potentially convertible to agriculture once drained. In reality, they are natural features of the global landscape that represent distinct and unique habitats for many species, some that are found nowhere else and others that reach their maximum abundance and/or geneticdiversity there. Temporary waters are also very important from a human health perspective since they function as breeding places for the vectors of many disease organisms, including those that spread malaria, schistosomiasis, yellow fever, and dengue. Most of these exact a high toll in terms of global human suffering and reduced regional economies. This book collates and synthesises the highly scattered and diverse global literature on pure and applied aspects of these habitats and their biota. It examines the ecology of temporary waters in both natural and human environments, and seeks to identify common evolutionary themes. It will be of particular interest to aquatic ecologists, invertebrate and vertebrate biologists, environmental biologists, wetland managers and conservationists,those charged with controlling water-associated diseases, entomologists, educators, and natural historians.